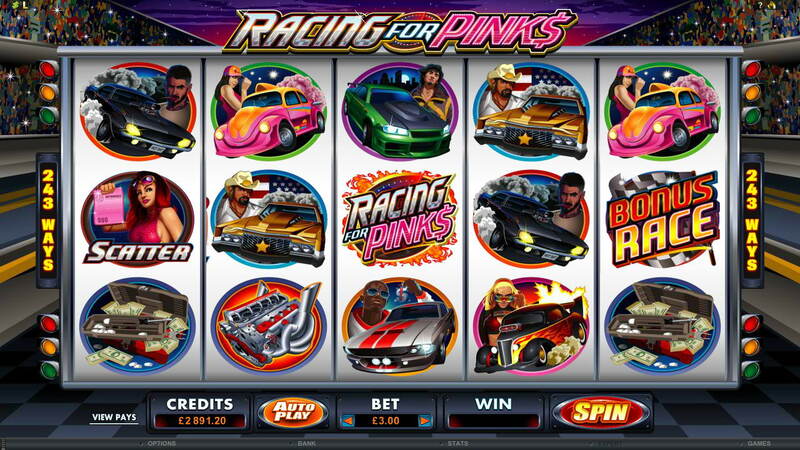 Car racing has always provided a rich backdrop for some of the best casino games and this autumn a brand new online slot, Racing for Pinks will have fans of slots and motor racing beating a hasty path to their favourite Microgaming casino. The name of the game is based on the American boy racer tradition of souping up their vehicles to race against other rivals cars for ‘pinks’, slips of paper which signified the ownership of the car. The winner achieving not just a victory, but also ownership of the losers vehicle. While players of this new game won’t have to stump up their own car as collateral when playing, it does offer some fantastic rewards for those lucky enough to hit the bigger features in the game. Land two of the Free Spin Girl symbols on reels one and five and you will earn yourself 30 free spins and any winnings you rack up during this section are quintupled thanks to a 5x multiplier. However for a truly epic bonus that will really get your engine running, you need to land a Bonus Race symbol on reels one and five. This brings up the Bonus Race feature. Here, over five levels, you get to back either the Red or Blue driver. Guess the winner correctly over each of the five levels and you can access a winnings multiplier of up to 175 times your winnings. The game is ideally suited also to the beginner, with spins starting at just 0.30 credits, however more experienced players of online slots will certainly find more than enough to keep them coming back for more. With plenty of wilds, scatters, multipliers and free spins throughout the game, Racing for Pinks promises to rev the excitement factor up when it hits Microgaming casinos on November 6th. Get a better re-deal with European Redeal Blackjack!